At last, a blog by a fish! 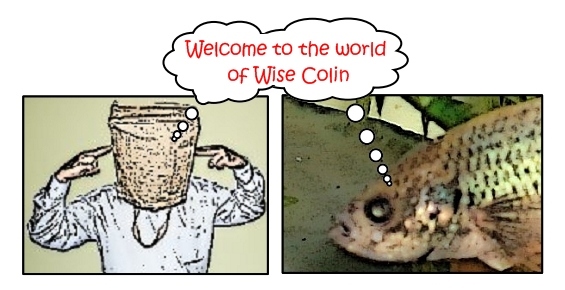 Welcome to the world of Wise Colin – life as seen through the eyes of a Siamese fighting fish and Zen Master of Street Signs. Of course, the words you are reading now are not my words, but are brought to you through the assistance of my fish whisperer, George. George, fish-whisperer and poor human specimen. Note how he channels me. Crude but effective. In the interest of public safety I insisted that George wear a bag over his head for this picture. He is just too photogenically challenged. To explain something of our method I will briefly describe how the whole thing works. George, after going deeply into trance, sits at his computer keyboard and tunes into my thoughts. Once the line of communication is open he “channels” me (fish joke), transcribing through his own weak brain the wisdom of my words to you. I hope as we go on this journey together you – humanity (aka loser species) – will benefit from my wisdom and learn to smarten up your ways. I should say at the outset that all flashes of brilliance and wit are mine and any lame jokes, bad taste, inaccuracies and inane comments are due to LIT (lost in translation) factors due to the inadequacy of the poor human specimen through whom I work. I should also add that sometimes I am affected by a pH imbalance caused by George’s inability to change my aquarium water on time. Siamese fighting fish and Zen Master Wise Colin in his purpose built aquarium tours the streets, assisted by fish whisperer George, to seek out signs of Zen relevance. In doing so vigilant Colin discovers signs of alien presence and attempts to warn the world of imminent invasion. Colin’s anxiety on this point is reinforced by the creepy sepia snail that co-habits his aquarium and whom he believes is using its antennae to communicate with its alien mothership. Colin’s life is further complicated by his many demanding roles and community service. As President of the Wise Colin Fish Hall of Fame he is charged with maintaining fish standards and rejecting sea life that do not measure up. Recently it has been his sad duty to reject dolphin. Colin has other expertise. In fact Colin is an expert in everything. As a forensic scientist he investigates crime. As a psychologist he advises. As a comedian he entertains us. As a philosopher he brings us his wisdom. Meanwhile Colin continues his main mission – the betterment of humanity by writing learned theories on its evolution. He also reveals the secrets of some of humanity’s greatest minds. Shakespeare’s ghost – why is he worried? 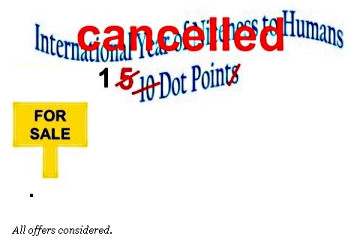 In addition he dedicates a whole year (International Year of Niceness to Humans) and ten dot points to writing nice things about humans but cancels the event due to stress and the lack of ideas about positive things to say. Unable to find even one nice thing to say about humans, Colin tries to find a buyer for his final dot point. Mrs Robinstone – a fish of experience. 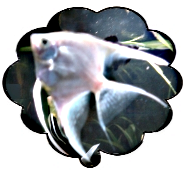 Colin (unbeknown to Mrs Robinstone) also has a girl-fish of his dreams, the curvy, sensuous, sultry, steamy Marilyn Angel Fish. See here as she wishes Wise Colin “Happy Birthday”. Not all is light on this blog, there is some dark as well. Colin is our hero, but every hero has an adversary, an opposing force against which he must pit himself. Evil Alistair, the world’s most intelligent goldfish, assisted by Lance, the goldfish fancier, is Colin’s adversary and sworn enemy. Will the forces of light conquer the forces of darkness? Only time will tell.